If you’re looking to surprise your hen with a party that can get the heart racing, then look no further than Brighton. Set on the Sussex South Coast its the ultimate hen party destination. A city known as much for its cheeky British seaside humour as the famous Royal Pavilion, Brighton is also the home of the gorgeous Butlers with Bums. And as the undisputed gay capital of the UK, Brighton has always known how to party – whatever your preference! Whether you’re looking to have a night out in the pubs and clubs of Brighton’s famous Lanes, or you’re after an altogether more refined evening, Brighton has it all. Our semi-naked butlers can make your evening the most unique and enjoyable hen party any of your guests have ever attended. Hiring a private room at a local hotel or night club? Our hunky butlers can help with the hosting – from making cocktails to delight even the fussiest drinkers to serving food and drinks to the other hen party guests, our butlers can make sure everything runs smoothly. Not only can our dreamy Butlers With Bums make your evening a wrinkle-free affair, they also come equipped with a lot more than serving skills. With a wide range of different party games hidden in the folds of their aprons, you can rely on our handsome hunks to keep everyone amused with their own brand of cheeky entertainment. For that added touch of class, your very own butler can greet the bride with a bouquet of roses and chocolates at the start of the evening with our welcome package, making her feel even more special on her hen night. Not only do we offer the welcome package, but we can tailor our services to suit whatever you have planned in whichever venue you have chosen. To find out how a hen party in Brighton with butlers with bums can really make you the best maid of honour that any bride can ask for get in touch with us and we’d be more than happy to help however we can. 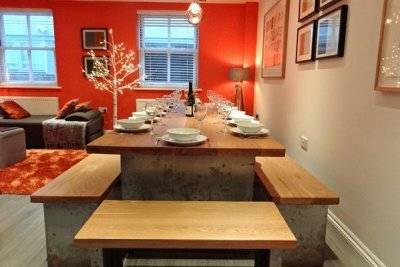 This contemporary, city centre townhouse, located just seconds from Brightons beautiful beach, the famous i360 and all the restaurants & bars of central Brighton. This city pad is ideal for those who want to be close to all the action. Two complimentary bottles of bubbly, rock sweets and guest toiletries await you at this Exclusive property for you to enjoy. Ground Floor Bedroom One – Sleeps 6 , in two triple sleeper beds. Large en-suite family bathroom, bath with overhead shower, wash basin and WC. Newly fitted large shower room together with a separate WC cloakroom. First Floor Living/Dining – Open plan with glass doors connecting to the kitchen. Comfy sofa and single sofa beds to sleep 2 guests. Large, refectory style, solid oak dining table and benches for 16. Cosy LED fireplace and copper side lamps. Wall mounted TV, DVD player, iPod dock and WiFi. 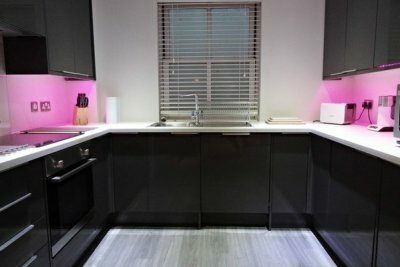 Kitchen – The on trend kitchen has gorgeous grey gloss units with sparkling granite worktops, colour change LED lighting, luxury mod cons and Bosch appliances: Utility Room – There is a further utility room with washing machine and a further larder fridge. Second Floor Bedroom Two – Sleeps 4, with triple sleeper and luxury single chair bed.Bedroom Three – Sleeps 4, with triple sleeper and luxury single chair bed.Bathroom – Bath with overhead shower, wash basin and WC. Unfortunately, due to its very central location, there is no on-site parking. The nearest car park is on Regency Square. A £500 non-refundable deposit is required within one week of booking to secure hen houses. This deposit will come off the remaining balance and is in addition to our standard deposit terms and conditions. This house also requires a £500 good behaviour bond one week prior to arrival, returned after check out once a house inspection is complete. 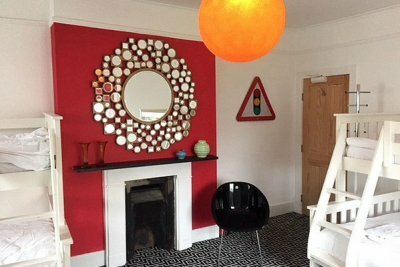 Comfort and glamour at its finest await you in this fabulously located central Brighton pad. An amazing opportunity to stay in a Grade II listed regency town house for your Brighton weekend. Just moments from the beach and a short walk along the seafront to all the action of the city centre. Situated in the heart of fashionable Kemp Town this little gem is just a stone throw from the seafront. Lower Ground Floor Bedroom Four – Sleeps 2, double bed. With new larger marble clad en suite shower room, wash basin and WC. Ground Floor Kitchen/Dining – Open plan kitchen/dining room, with table to seat 20 and Bose Bluetooth speakers. Cloakroom – With wash basin and WC. 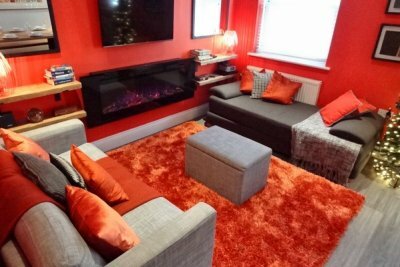 Living Room – Plenty of seating with L-shaped sofas which convert into 2 single beds, plus a large arm chair and a further 2 seater sofa which converts into a single bed. Sleeps 3 guests in total. Flat screen TV with Freeview, DVD player, Bose Bluetooth speakers and Wifi. Bedroom One – Sleeps 6, in four single beds and a bunk bed. Bedroom Two – Sleeps 3, in a triple sleeper. (Double bed with a single bunk above). Bedroom Three – Sleeps 3, in three single beds, two of which can be zipped together to make a king size double. Please advise preferred set up at time of booking. En suite with bath, shower cubicle, WC, wash basin and heated towel rail. Family Bathroom – With bath, shower over, wash basin and WC. There are a few steps up to the main front door from street level. The property is arranged over 6 floors. There is no dedicated parking space at the property. Please do read the parking signs on the streets for specific instructions. Guests are advised to exercise caution on the balcony! – not suitable for ladies in heels! This stunning four bed property situated in the heart of fashionable Kemp Town just moments from the seafront. The property will sleep 18 guests comfortably and has been newly renovated. Beautifully bright and stylish throughout. Brasseries, antique shops, trendy coffee houses, pubs and restaurants are all just around the corner and it’s a short stroll to the centre of Brighton. Shower Room – Shower, hand basin and WC. Living/Dining – A large light bright room. Dining table to seat 10. Leather Chesterfield sofa which converts to a bed, to sleep 2 guests. Wall-mounted Smart TV. WiFi access. Kitchen – Fully equipped, with a table and chairs for three, plus two bar stools. 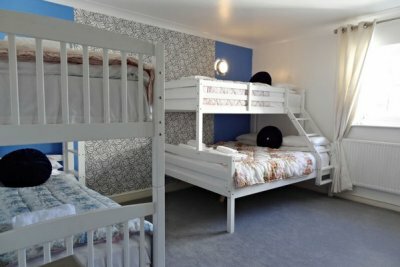 Bedroom One – Sleeps 6, with two triple bunk beds. Bedroom Two – Sleeps 3, with a triple bunk bed. Bedroom Three – Sleeps 3, with a triple bunk bed. 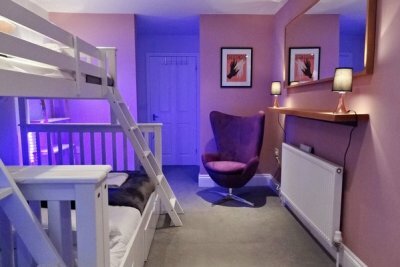 Bedroom Four – Sleeps 3, with a triple bunk bed. There is no dedicated parking space at the property. The nearest car park is High Street Car Park, just off St.James Street. This stunning Brighton vintage house has super stylish eclectic interiors. Situated just off the seafront in central Brighton located close to all the action of the seafront and local shops and bars. This is the ideal large holiday house if you are looking for a luxury vintage property. 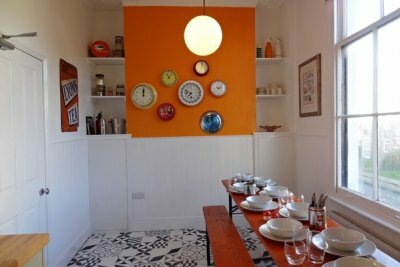 Kemptown has so many lovely eateries, stylish boutiques and of course gin and cocktail bars, all on your doorstep. Live like locals and explore the area or stroll down to the beach in just 5 minutes. 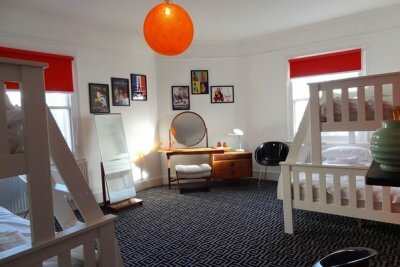 Vintage Vixens Room – Sleeps 4, in two sets of single bunks. 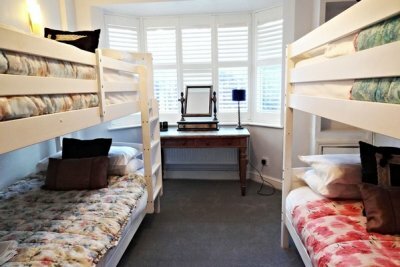 Sirens Suite – Sleeps 3, triple bunk. French doors open onto the terrace. Bathroom – Bath with shower overhead, wash basin and WC. Tropical Terrace – Large enclosed terrace, with super sized Betty Paige wall mural. Accessed from the Sirens Suite. The Party Parlour – A glamorous party parlour , you can entertain at home with the black dining table for the full quota of guests with turned leg upholstered benches and padded diamante burlesque back rests. Large flat screen 47″ 3D Freeview TV and Blu-Ray surround sound system. Hello Sailor Room – Sleeps 7, in one triple sleeper and two sets of single bunk beds. 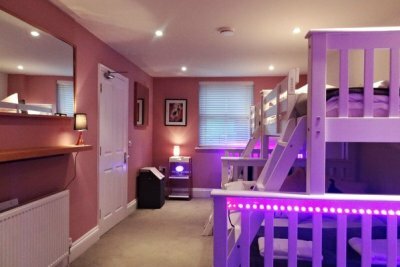 Dolly Dazzle Room – Sleeps 2, double bed. Bathroom – Large walk in shower, wash basin, heated towel rail and WC. This central Kemptown period townhouse, situated moments from the seafront has been immaculately styled by the owner. 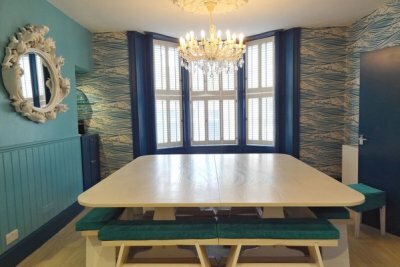 Perfect for your stay in Brighton and amazing for a Mermaid themed Hen weekend! 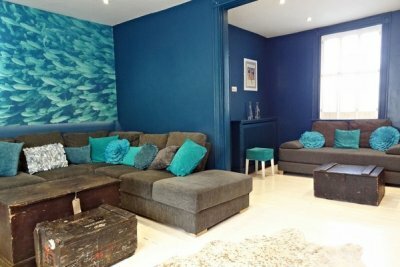 This three bedroom property has lush comfortable interiors full of mermaid delights. The beautifully chosen colour scheme of teal, aquamarine, pearl and pinks and accents of gold are feminine and sophisticated. 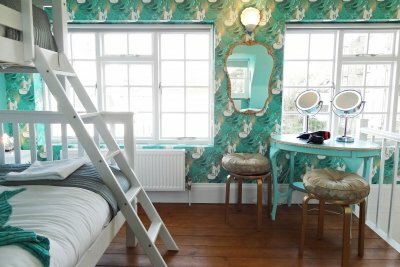 Vintage treasures, ornate mirrors, sassy mermaid wallpaper and elegant soft furnishings are richly combined for your luxury stay in Brighton. Bathroom – Spacious and beautifully finished with bath and separate shower, wash basin and WC. Kitchen/dining room – The dining table seats 16 with bench seating and is a great place to enjoy a meal together. Feature mermaid wallpaper and art. The kitchen is fresh and contemporary with brink tiling. There is a small outside smoking terrace just off the kitchen. The Mermaids Salon – Really spacious living room with feature mermaid art, waves wallpaper and golden accents. The room divides itself into two sections. There is a corner sofa bed which is a spacious area for 1 guest to sleep. One comfortable chair bed to sleep 1 guest. In the other part of the living room, there is another small, double sofa bed to sleep 1 guest. An elegant room with bags of character and of course the sea view! Sleeps 3. 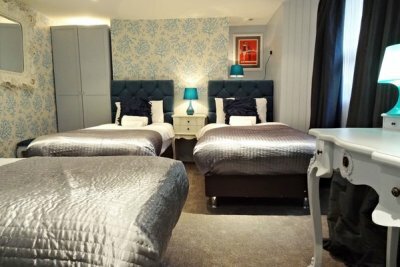 The Aquamarine Room – Sleeps 4, with a triple sleeper and trundle bed with full size single mattress. 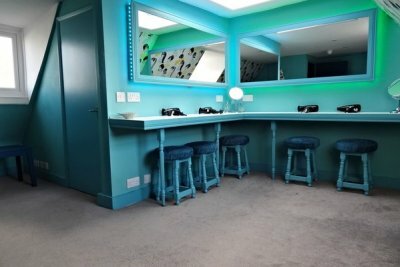 Feature mermaid wallpaper, huge full length mirror, dressing table seating 4 people. Bathroom – Another contemporary and spacious bathroom. With bath and separate shower, wash basin and WC. 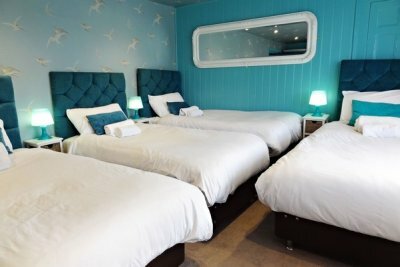 The Siren’s Nest – Sleeps 6 – A huge room with a triple sleeper and two single beds, and a further comfortable chair bed. Feature mermaid wallpaper and art. There is no dedicated parking space at the property.